Egyptian media is reporting that Russia has signed a $2 billion arms deal with Egypt. According to the reports, Saudi Arabia and the UAE will finance the deal. Officials in Cairo have so far refused to comment, and analysts are debating whether this information is accurate. The first reports of a possible arms deal were published last November when Defence Minister Sergei Shoigu and Foreign Minister Sergei Lavrov were visiting Cairo. According to Kommersant, after talks with his Egyptian counterpart, Lavrov confirmed that one of the main topics they discussed was, in fact, military cooperation. Reports even suggested the future contract would be worth $4 billion, however, the specific details of the agreements had not yet been discussed. The fact that Moscow and Cairo are negotiating an arms deal only means that an old tradition is being revived. In the 1950-70s, the USSR was the largest supplier of arms to Egypt. In the last years of President Hosni Mubarak's term in office, Russia began to re-emerge on the Egyptian market. In 2010-2011, Russia and Egypt reached a preliminary agreement to buy military equipment (mainly helicopters) and modernize their air defence that was worth $1.5 billion. However, after the overthrow of Mubarak, military cooperation was halted. Egypt simply did not have money to buy weapons. The situation changed after Morsi was overthrown. Now the main hope lies with external sponsors. Saudi Arabia supports the country's current government and is one of its major sponsors. In addition, the Saudis have already subsidized weapons purchases for Muslim countries. For example, the Saudis have repeatedly provided Morocco with soft loans to purchase arms. 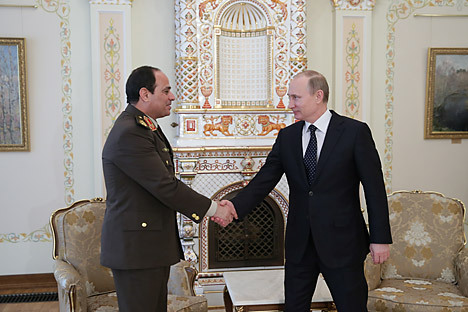 The Egyptian media has not yet reported what exactly will be supplied under the proposed Russian-Egyptian deal. Different scenarios have been offered up. It could be MiG-29 fighters or Kornet anti-tank missiles. In addition, a number of Egyptian observers are saying it may be the Iskander tactical missile. However, experts believe that this is unlikely. The question remains as to why Egypt would spend money on Russian weapons now, when the economic situation in the country leaves much to be desired? Alexander Ignatenko, President of the Institute of Religion and Politics, commented in an interview with Vzglyad that the current leadership of Egypt feels that the country has a large number of external threats. Observers also note that Egypt has the largest army in the Arab world, which acts a deterrent to Israel and is one of the guarantors of security for the Arabian monarchies, particularly in the face of the Iranian threat. So a weaker Cairo would change the balance of power in the Middle East. Given these conditions, Saudi Arabia and the UAE actually may finance the purchase of weapons.